Armed with the blood pumping through our veins we first took some photos for the local paper and Red Cross Media outlets. Once we had the photos and visiting the good Imperial citizens that were donating to save our fellow troopers. One lady was going to donate to Jedi scum but she was terminated. Her own fault really. 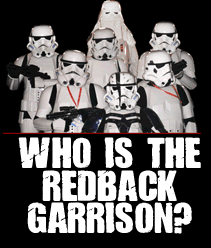 Congrats to the Redbacks who set a new record for blood donations in one day! This entry was posted on Sunday, July 4th, 2010 at 3:11 pm	and is filed under Mission Reports. You can follow any responses to this entry through the RSS 2.0 feed. Both comments and pings are currently closed.